C.R. Rao’s photo with a write up of his work is included in the recent book on Faces of Science by Marianna Cook, featuring the work of scientists of the last century who made fundamental contributions to science, published by W.W. Norton & Company. His portrait was exhibited for the public in the Gallery of Arts and Science of the New York Academy of Sciences during the period Sept. 9-Oct. 14, 2005, at the National Academy of Engineering in Washington during July 2007, and National Academy of Sciences in Washington during August, 2007. 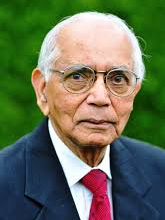 C.R.Rao is included in the above publication (available on website: figures from the history of probability and statistics) by John Aldrich, University of Southampton, UK, describing the work of 35 major contributors to the development of probability and statistics since 1650. C.R.Rao is listed in the amstat.org. Statisticians in History website with a write up of his contributions to statistics. For his outstanding achievements, C.R. Rao has been honored with the establishment of an institute named after him: C.R. Rao Advanced Institute for Mathematics, Statistics and Computer Science (C.R.Rao AIMSCS). The Institute, located in the campus of the University of Hyderabad., is expected to play an important role in improving the quality of teaching, encouraging basic research in mathematical and social sciences and promoting applications of science and technology in all areas of human endeavor. Wikipedia, Free Encyclopedia mentions C.R.Rao as the notable student of the father of modern statistics, R.A. Fisher.